The first thing to say about this online slot from Novomatic/Green Tube are that these birds are not angry – definitely not. They are in fact Crazy Birds whose colourful plumage lights up the forest in which they live. Read on to find out about the bonus features these creatures can award. 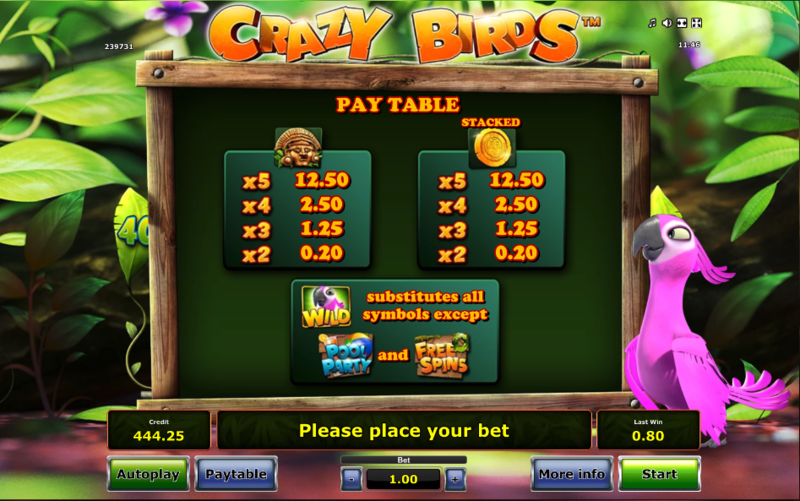 Crazy Birds is a five reel slot with four rows and forty fixed paylines; those reels spin within a frame formed by vines and thin branches and there’s plenty of undergrowth in the background to accentuate the forest setting. Potty (the pink bird) stands to the right of the reels. The high value symbols include a tribal mask, a gold coin (which can be stacked on the reels), a more basic mask and a nest containing three coloured eggs; 10, J, Q, K and A make up the lower values. Potty is wild and he/she will replace all others to help form winning combos except for the Pool Party and Free Spins bonus symbols. Potty will add extra wilds to the symbols. Rocky will punch the reels, removing symbols and replacing them with a winning combo; those winning symbols will then disappear for more to fall down and this process can continue until there are no more wins. Loopy will spin a Wheel of Fortune to award a cash win, a winning spin, free spins or the Pool Party feature. This is triggered by matching up the Pool Party symbols on reels one and two; now just pick one of the three birds and watch it fall between pools of water, collecting prizes as it goes. Lucky players will see another bird fall as well. Trigger this by matching up the Free Spins symbols on reels four and five; you’ll get five free spins initially but more can be won along the way. Landing wild symbols can bring extra wilds onto the reels. Each base game win can be gambled by clicking the ‘Gamble’ button below the reels; you now try and double your money by playing a simple game in which you just have to guess whether the next card drawn will be red or black. Wins can be gambled up to five times but a wrong guess will lose everything. 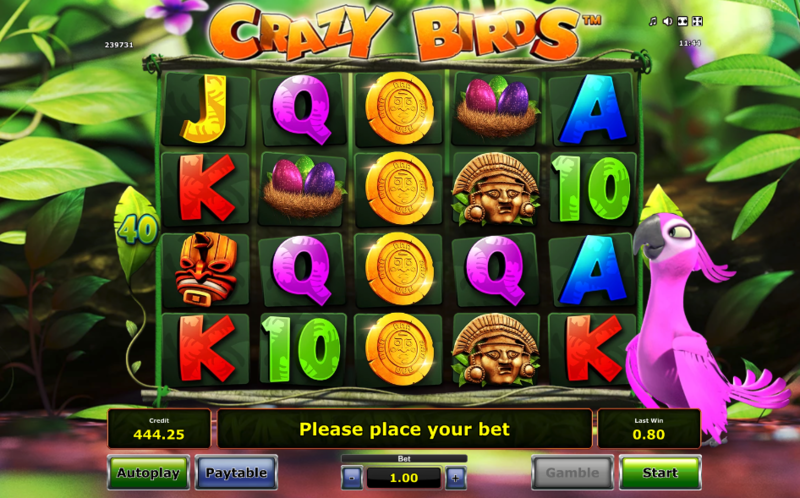 Crazy Birds is a colourful and fast-moving journey into the jungle life of these cheerful and helpful creatures and it’s certainly worth a few spins; set the Autoplay for your desired number and watch the avian action unfold.